When you set up your home office, your aim should be to create the ideal working environment, one where you can be highly productive. In order to achieve this, you need to identify what computer systems and office equipment you will need. If you skip this process of setting up your office properly, you will waste time using either outdated technology or manual methods to get things done. It's a good idea to do some basic research to find out what other people in your line of business are using in their home offices. This information is freely shared on blogs and social media. Of course, you don't have to aim for perfection, but at least get the basic stuff that you need. Over time, of course, you can add much more functionality to your office as your business matures. 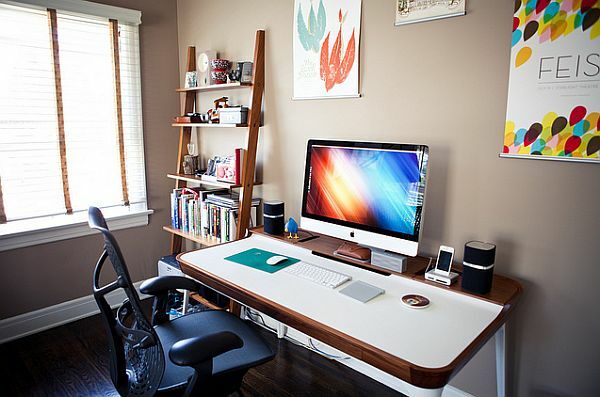 Here are 10 ideas to help you figure out what type of technology you need to buy or use when you organize your home office. Computers and Devices: Decide what kind of computers and devices you need. Do you need a desktop? Do you need a laptop? Do you need a smartphone? Do you need a tablet? Answering "yes" to all these questions is a perfectly acceptable answer. For instance, if you have both a desktop and a laptop, then you could watch a software training tutorial video on your desktop while following along on your laptop. This will be much easier than flipping between tabs on your desktop. Internet Service: You will definitely need high-speed Internet. However, you might want to consider bundling to save money. Some providers like Suddenlink will allow you to save big when you package all your telecommunication needs. Instead of just buying Suddenlink TV, Suddenlink Internet, and Suddenlink phone services separately, buy them all together as a bundle. Monitors: Consider other things that you will need to increase your functionality. For instance, you may need a larger monitor on your desktop than the one that you have now or that comes when you buy a computer off-the-shelf. Depending on the nature of your work, you may also need to use dual monitors to enhance your productivity. Software: Although you will get software when you buy a new computer from a retail store, it is usually just basic software. In order to run a professional business, you will probably need more advanced software. You could buy software in a box or download it directly from a software business's website. However, you may also want to consider using cloud software services. For a low monthly fee, you will get the latest cutting-edge software in your field. Moreover, when the software gets updated to the latest version, you will not be charged extra for the upgrade. With boxed software, you will have to pay full price to buy each new version. Since software changes so rapidly, a dated version will begin to be considered old in just a year or two. Backup Drives: Think about how you will back up your data. You could use a cloud-based solution to automatically copy your files or an external drive to serve as an in-house backup drive. Wireless Router: You might need a wireless network router if you have a home network for business associates or family members. It's useful if there are several computers around the house that all need Internet access at the same time. Surge Protector: A surge protector will help protect your computer from disruptions due to power fluctuations. Uninterruptible Power Supply (UPS): This is useful for an electricity blackout. It will give you buffer time so that you can save your work and properly shut down your computer. Multipurpose Printer: While you might strive to have a paperless office, there will be times when you need to print, scan, fax, or make paper copies of documents. You won't need to get several pieces of equipment. A multi-purpose machine can do all these various tasks. Paper Shredder: You can use this to shred sensitive business information, and it's also an eco-friendly way of managing all your scribbled notes and used up paper. As your business evolves, you will have a better idea of what technology you will need, but these 10 tips will help you establish a good foundation for your business success.